Today, Klyn is living her “second chance.” Her close call with mortality has made her ever present to the gift in each moment + given her a unique ability to unearth happiness in every moment. It’s always going to be different and tough. Get over it. I know I can control the moment and how I feel about the moment. I’ve come to terms with my disease and when you come to terms with it, then you can focus on what you can do in the moment. Perceived progress: Set your goal and actually do something about it everyday. Don’t wait for one day because one day never comes, okay? Vision or meaning: You’ve got your goals. Now, bring it to a bigger purpose. Seeking your purpose? Don’t just reflect ACT. MOVE. DO. 1. What is the best book you've ever read? Compound Effect, Darren Hardy. My main takeaway: Where you are heading right now will continue to snow ball through your entire life. If you don’t like the trajectory of the life in which you are heading, change it right now. 3. Your house is on fire, all living things and people are out. You have the opportunity to run in and grab one item. What would it be? I’m not going back in. I don’t care. I don’t need of it. None of it matters. 4. You are sitting on a bench overlooking a gorgeous beach. You have the opportunity to have a long conversation with anyone living or dead. Who would it be? John O’Leary 2.0. Let’s do it! 5. What is the best advice you’ve ever received? When someone loves you enough to tell you you are messing up so you can come out stronger on the other side. 7. It's been said that all great people can have their lives summed up in one sentence. How do you want yours to read? And she’s still laughing. 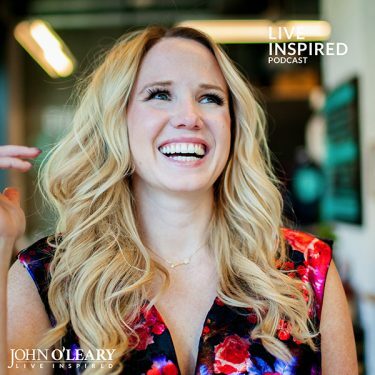 The post Live Inspired Podcast: 4 Ways to Find Your Happy with Klyn Elsbury #108 appeared first on John O'Leary.